Our scenic helicopter tours allow you to soak in peak-to-peak views, fly over pristine wilderness, and see the unparalleled beauty of Lake Tahoe from the air. Daily helicopter tours are offered, departing from the Lake Tahoe Airport. Our expert pilots will guide you through a one-of-a-kind tour over incredible destinations, including: Emerald Bay, Fallen Leaf Lake, Desolation Wilderness, Crystal Bay and Sand Harbor. 10, 20, 30, 45 and 60 minute tours are available. Walk-ins are welcome, call for availability. We fly the Robinson R44 Raven II, with bubble windows and air conditioning. Tahoe Helicopters provides scenic helicopter tours, high altitude flight training (primary and advanced), and a platform for aerial photography. See majestic Lake Tahoe the way it was meant to be seen...from a helicopter! Our scenic flights over majestic Lake Tahoe depart daily, year-round, from the Lake Tahoe Airport (KTVL). Online booking is available with live calendar availability. Walk-ins are welcome and bookings can be taken over the phone at 530.544.2211. See our FAQ page for any additional questions. 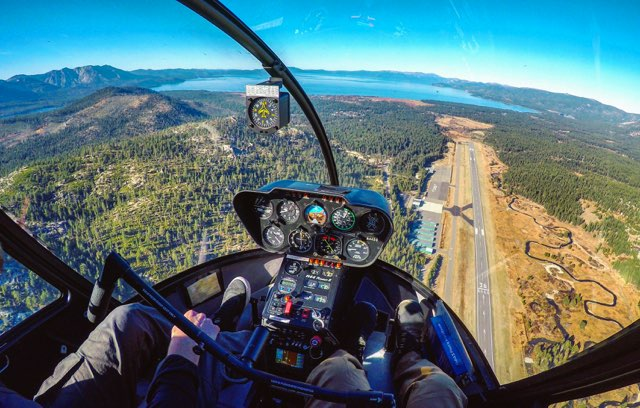 Tahoe Helicopters provides primary and advanced flight training all from the South Tahoe Airport, with a field elevation of 6,264ft above sea level. Train with Tahoe Helicopters and you will gain intimate knowledge of mountain flying techniques, such as power management in power-limited environments, and an understanding of mountain and valley wind patterns. Aerial photography is used in real-estate advertising, land-use planning, movie production, environmental studies, animal counting, construction project surveillance, commercial advertising, and artistic projects. Give us a call to see how we can help your project take flight. Our pilots are also part 107 certified for small UAS.